Siderophores produced by rhizosphere bacteria may enhance plant growth by increasing the availability of Fe near the root or by inhibiting the colonization of roots by plant pathogens or other harmful bacteria. To examine the populations of siderophore-producing bacteria colonizing the roots of two grass species that differed in their susceptibility to Fe deficiency, we inoculated serial dilutions of root samples onto chrome azurol S (CAS) agar and several other selective and non-selective culture meida. CAS agar effectively differentiated bacteria that were capable of excreting large amounts of siderophore, but the composition of the medium limited its usefulness for ecological studies. A large proportion (71–79%) of the bacterial population that grew on a non-selective medium (tryptic soy agar) failed to grow on CAS agar, and several isolates that showed no sign of siderophore production on CAS agar produced siderophore in liquid culture. 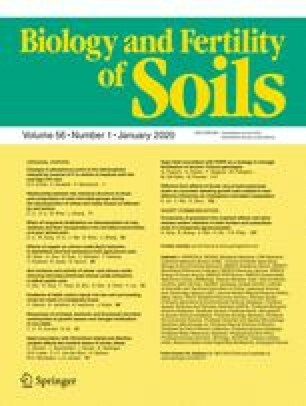 Similar populations of siderophore-producing bacteria were observed on roots of St. Augustine grass, which frequently exhibits Fe chlorosis, and bermuda grass, which does not. Roots of both grasses were colonized by bacteria that produced siderophore in vitro at concentrations ranging from 100 to 230 μM. The CAS assay solution was also used to compare siderophore production by Pseudomonas fluorescens Q6, an isolate from bermuda grass, and by P. putida B 10, a plant growth-promoting pseudomonad. P. fluorescens Q6 produced 2.4 times more siderophore in vitro than P. putida B 10.